We need to meet about that <insert random project> pretty soon. How’s next week for you? Let me know. You’re right. I’ve been meeting to get in touch with you about that. Next week should be fine. What time works for you? Well, I’m pretty booked Monday morning, but I’m relatively free other than that. How about Thursday at 3pm? I can’t do Thursday afternoon. I have a dentist appointment. What about sometime Wednesday afternoon? I could also do Friday afternoon. Wednesday afternoon won’t work. Let’s plan for Friday at noon. No, I can’t do noon on Friday. I was thinking about sometime after 1pm. What about later in the afternoon? Oh shoot, I just booked something else for Friday afternoon, so I can’t do that. My week’s getting pretty full now; maybe we should look at the following week. Do you have any free time the week after this one? I would hope that this email correspondence doesn’t sound too familiar to any of you, but I’m sure most of us have been a part of an unsuccessful attempt to schedule a meeting. Of course, if you’re scheduling a meeting with co-workers and you have a calendaring and email system like Microsoft Outlook, you can avoid all of this by checking someone’s calendar and sending a meeting request. But what if you don’t have Outlook? Or you’re trying to schedule a meeting with someone who still prefers to use a paper calendar? Or you’re scheduling a meeting with someone outside your organization? Doodle is a scheduling application that you can use to overcome any of the above situations. 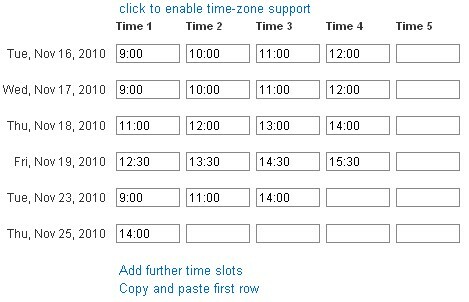 It “takes the pain out of finding the right date and time” by letting meeting attendees select the times that they are available from a pre-designated list of times/dates. Once everyone has added their availability, the meeting organizer can choose the best time to meet. Best of all, the basic service is free! Before starting, create an account. Once you’ve created your account and logged in, you’re ready to start scheduling meetings. Click the “Schedule event” link. Click "Schedule event" to start. From here you can enter basic information about the meeting/event, such as Title and Description. This information will show up on the page that meeting attendees see when they fill in their availability. Click ‘Next’ to move on to the screen for select potential dates for meeting. (Note: it is a good idea to pick dates/times during which you – as the meeting organizer – are available.) Don’ worry about the times at this point; you’ll get to enter those later. Also, Doodle suggests that 5 possible meeting times is usually enough to find a common time – I question that, though I haven’t found a magic number. Choose potential meeting dates. Doodle suggests that 5 potential dates/times will suffice. After selecting possible meeting dates, you’ll next be asked to choose times during which meetings could take place. These can be entered in various ways. For instance, you could say 9am, 9:00-10:30, noon, or 15:00. Fill in the potential meeting times. You can either manually send out invitations to the scheduling poll or do it through the Doodle interface. I would recommend the latter option. Doodle will alert you when someone fills in their availability, as well as tell you when all attendees have completed the poll. You can then go in, select a final meeting time, and send it to all attendees. I would recommend having Doodle send the invitations. If you chose to have Doodle send the invitations, you will be prompted to enter the attendees’ email addresses. You also have the ability to enter a customized message that will be sent along with the invitation. Each attendee will receive an invitation, including a link where they can fill in their availability. They will also see the availability of others who have completed the poll. The user simply checks the times during which they are available and clicks ‘Save’. The attendee can see the availability for other attendees who have completed the poll. When all attendees have completed the poll you (or whoever the organizer is) will receive an email indicating this and asking you to choose a meeting time. When you go back into the Doodle poll, you’ll see everyone’s availability, as well as a count of how many attendees are available during each potential meeting time. Typically, you would choose the time when all/most attendees can come, but of course you could apply your own criteria as well. Choose the time that works best for you and the other attendees. Doodle will send a notice to all attendees about the final meeting time, or you can choose to send this on your own. Don’t leave the poll open for too long. People’s schedules change, and if you leave a poll open for longer than a day or two, some of the times during which they indicated they are available may no longer work by the time your poll closes. Related to #1, always give your attendees a deadline for completing the poll. Close the poll and choose a time as soon as the deadline arrives. It’s unfair to the attendees who fill in their availability to have to wait for a few stragglers. Emphasize that they should fill in ALL times during which they are available. Some attendees may be inclined to just offer up an hour or two of their time even if they have many more hours during which they could meet. Remind them that the meeting is only 1 hour (or whatever the length is) no matter how many time slots they make available. There are several other scheduling applications out there. Let us know in the comments area if you’ve used one that you like. Remember, just because it’s easy to schedule meetings with Doodle doesn’t mean you should! Hi David, thanks so much for a great Doodle pitch and tutorial! Can Doodle send reminders to non-responders or does the administrator have to see who needs prompting and send ‘manually’? You can, but only with one of their premium accounts. They have three levels of premium accounts: solo, business, and enterprise. The solo account is $29/year. More info about their plans is located here: https://www.doodle.com/premium/plans.html.